Recently when Stockholm-headquartered Truecaller decided to roll out its first ever brand campaign, it zeroed in on India. The company funded by the likes of Sequoia Capital and Atomico opted for an unusual choice of brand ambassador. Instead of the dolled up glamorous heroes, starlets and fading stars who are endorsement’s stock-in-trade, Truecaller opted for the relatively commonplace looking Nawazuddin Siddiqui. The actor known for his offbeat characters and roles will now be the face of an 80 million strong market that accounts for over 50 per cent of Truecaller’s global user base. Explains Kari Krishnamurthy, vice president, growth and partnerships, Asia & country manager, India, Truecaller, “We all have our own stories. It’s important how we relate our stories to a larger audience and that is what worked really well while choosing Nawazuddin.” His own life story of the one call that he got (much before the days of Truecaller) fit into our brand story like a hand in glove, he adds. The brand currently a free service is looking to reach a user-base of 150 million by December 2015. There is a rising trend of brands looking for unconventional, real and relatable endorsers creating an increasing demand for Irrfan Khan, Siddiqui, Kapil Sharma and Radhika Apte among others. Vinil Mathew, director, Breathless Films, attributes this to advertising moving to a more ‘real’ space. From just being aspirational the focus now is on making characters credible. As society evolves, stories are increasingly about day to day life. Which explains the appeal of many of these names at the cost of the more ubiquitous and expensive Khans and Kapoors. A few months back, when the online marketplace brand IndiaMART decided to go in for its full-fledged brand campaign after being around for nearly 20 years, it chose Irrfan Khan. 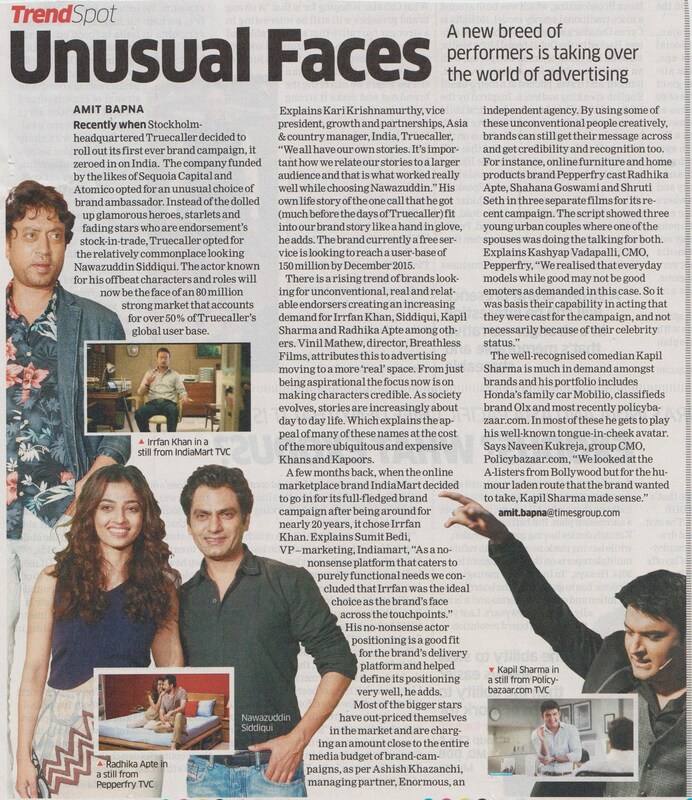 Explains Sumit Bedi, VP – marketing, IndiaMART, “As a nononsense platform that caters to purely functional needs we concluded that Irrfan was the ideal choice as the brand’s face across the touchpoints.” His no-nonsense actor positioning is a good fit for the brand’s delivery platform and helped define its positioning very well, he adds.